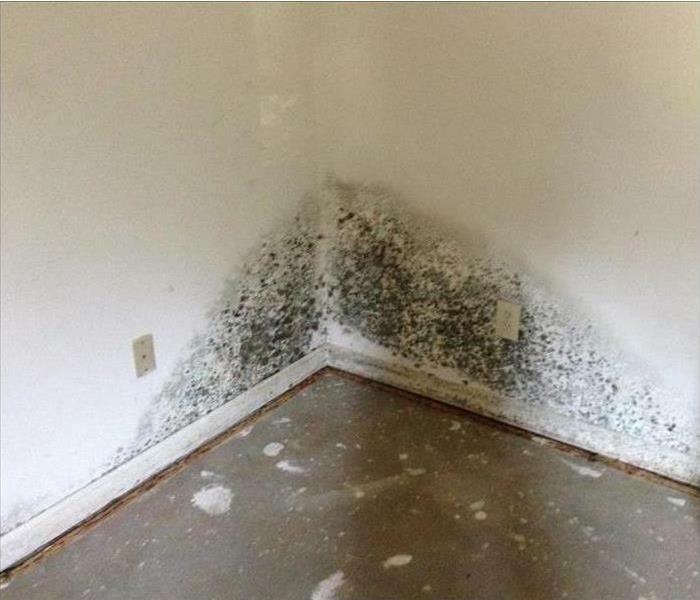 A homeowner in Leland, NC was recently doing some heavy spring cleaning in her home when she came across what she though was mold behind her refrigerator. Instead of just wiping it down or having her husband tear open the wall, she decided to give SERVPRO of Brunswick & South Columbus Counties a call to check out the suspected mold. She had used them previously at work and was comfortable that they could handle the job. She made the call and was very happy that she did. It turned out to be Mold as she suspected. The technician from SERVPRO of Brunswick & South Columbus Counties did a thorough inspection and determined that it was Mold and found the source. Apparently, the water hook-up to the refrigerator had a very small pin size hole in it which was leaking onto the wall and onto the floor. After being referred to a plumber that could fix the leak, SERVPRO went to work to contain the Mold, clean the affected areas, and make sure to get the air filtered with air scrubber. Everything was clean and dry! With one call to SERVPRO of Brunswick & South Columbus Counties the homeowner had her mold issue taken care of completely. 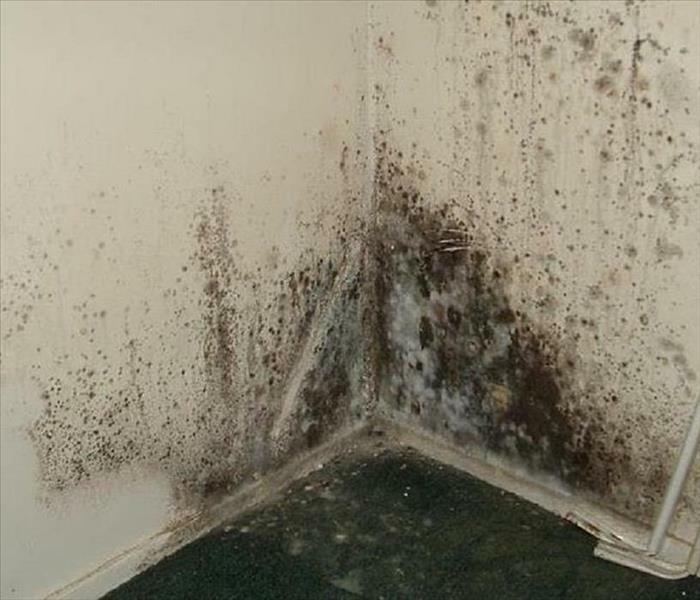 If you suspect you may have a Mold issue, SERVPRO of Brunswick & South Columbus Counties can help. Call us today, 910-755-6717! A local maintenance supervisor at a Leland school walked in to find 3 classrooms flooded from water fountain that broke free from the wall and fell to the floor. Luckily this happened overnight on a weekday and not on the weekend when the mess could have become much larger. Having used SERVPRO before at a previous school at which he had worked, he knew to call SERVPRO right away. The supervisor actually had the number handy in the ERP he had completed with the SERVPRO of Brunswick and South Columbus County marketing rep a couple months ago. After getting the water shut off and getting the water fountain fixed, SERVPRO began their services. 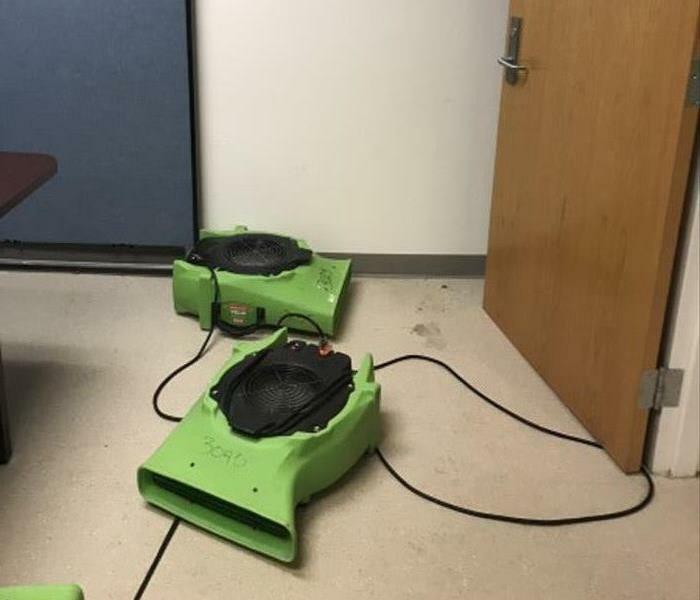 Air movers and dehumidifiers were placed throughout the classrooms and things were “Like they never even happened” within a couple days. Are you a maintenance supervisor in need of emergency help at your commercial property? SERVPRO of Brunswick and South Columbus Counties is here to help! You never know when you are going to need help and SERVPRO of Brunswick and South Columbus Counties is always ready to help with commercial fire or water damage. 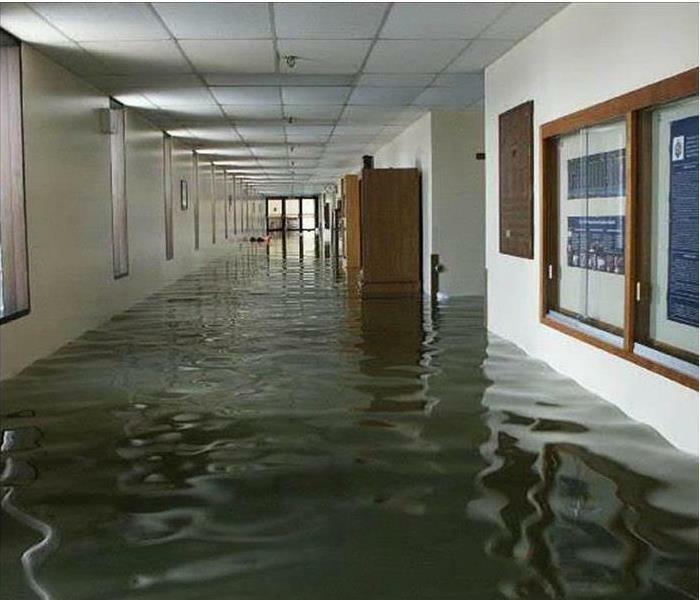 If you have water damage in your commercial property, call SERVPRO of Brunswick and South Columbus Counties today, 910-755-6717. Out of town on a vacation that the homeowner was dreaming of for months, he receives a alarming call from his neighbor. There had been a fire at his Leland, NC home in Brunswick Forest. His neighbor has assured him that it was just a small fire and the Brunswick County fire department has everything under control. 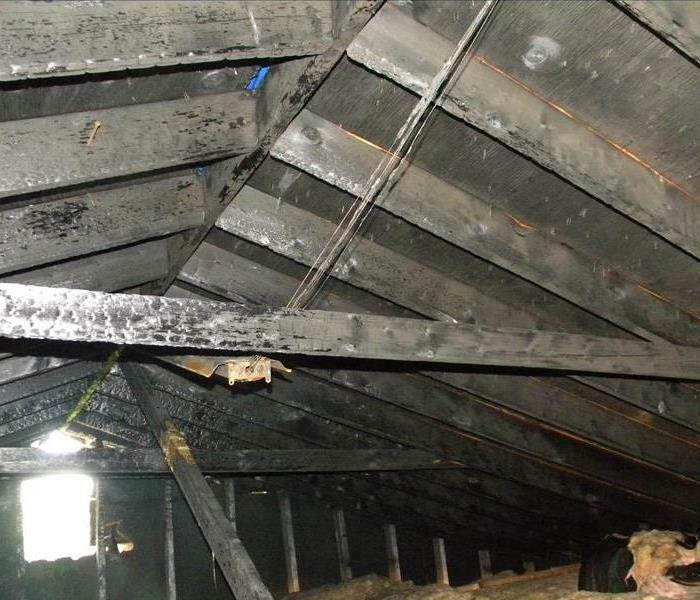 The fire was in his attic and was started by his HVAC system. Structurally the home and roof were intact, his HVAC needed replaced and he needed his attic contents and some upstairs bedrooms cleaned. His first thoughts were of SERVPRO. He had used SERVPRO for a water damage in his rental unit a few years prior. The homeowner called SERVPRO of Brunswick and South Columbus Counties and sent an appointment for when he would be back in town. Upon meeting with the SERVPRO Production Manager and going over the scope of the fire damage and the course of action, the homeowner was appeased. The hardworking crews started the next day with removal of smoke and soot from the home. Within a few days, the team from SERVPRO of Brunswick and South Columbus Counties had things back “Like it never even happened.” If you have smoke or soot damage from a fire in your residence or commercial building, call SERVPRO of Brunswick and South Columbus Counties today, 910-755-6717. SERVPRO of Brunswick and South Columbus Counties is Here to Help! A commercial property manager goes to do a quick walk through a small shopping plaza which has just been constructed. Expecting to see that finishing touches will be needed before the new tenant can move in, the manager notices large patches of dark material throughout the space and on nearly every wall. Mold. Realizing that she needs to act quickly, she calls SERVPRO of Brunswick & South Columbus Counties. With the manager getting ready to get a lease signed and have a tenant move in within a week, SERVPRO of Brunswick & South Columbus Counties moved quickly to get remediation services started. First, SERVPRO made sure that the source of the water or moisture were addressed. Next, the highly trained technicians were able to remove drywall were needed and clean all the surfaces using HEPA vacuums. Finally, air scrubbing filtration equipment and dehumidifiers were run in the contaminated commercial unit. Once again, SERVPRO of Brunswick & South Columbus Counties was able to help another commercial customer. 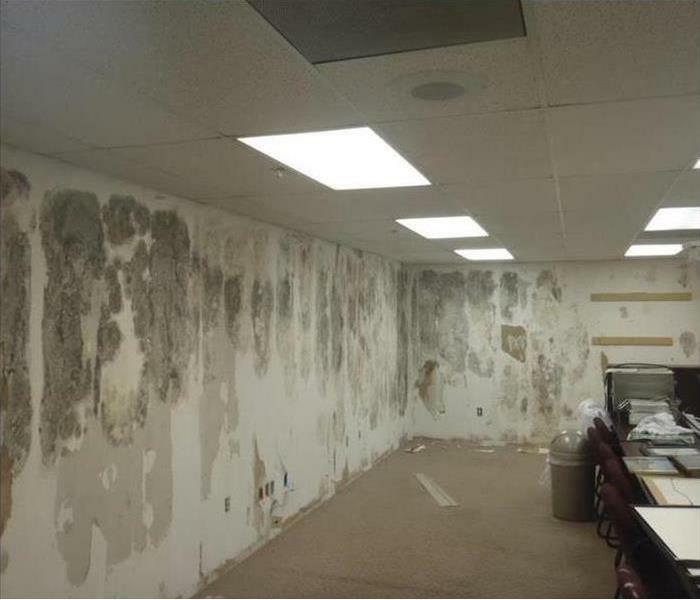 If you think you may have an issue with mold in your home or commercial property, call SERVPRO of Brunswick & South Columbus Counties today. 910-755-6717. SERVPRO of Brunswick & South Columbus Counties is Here to Help! Make sure to be safe this Holiday Season! The Holidays are upon us again this year. And with the Holidays comes the increased risk of house fires. 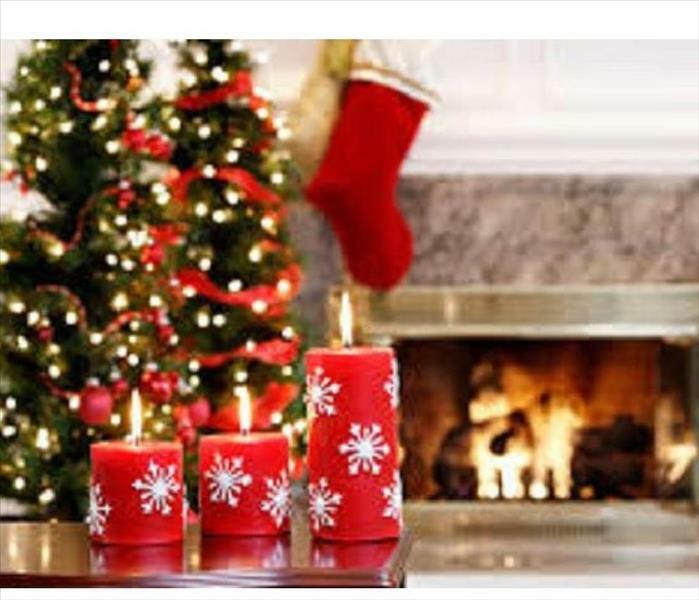 Whether from candles burning in the home, lighted decorations, Christmas Trees, or the Holiday cooking, the Holidays are prime season for house fires. SERVPRO of Brunswick and S. Columbus Counties wants to make sure you and your loved ones play it smart and safe! Cooking- If you are going to deep fry your turkey, make sure to do it outside on level ground and at least 20 feet from your house. Candles- If you are going to burn candles in your home, make sure to leave about 1-2 feet of space in every direction between the candle and anything flammable. Christmas Trees- Make sure to get a freshly cut Christmas Tree and to keep it thoroughly watered throughout its time on display. Artificial trees aren't of too much concern as most are flame- retardant. Decorative Lights- Make sure to inspect all strings of lights and extension cords for damage or frays. Fireplaces- Soot build-up can catch on fire. Make sure to get your fireplace cleaned before using each burning season. Also, use a screen to keep sparks and embers from popping out. These are just a couple tips to keep you safe this Holiday Season! Caswell Dunes Damaged by Hurricane Florence. SERVPRO is here to help! With Hurricane Florence long gone, North Carolina struggles to recover from the damage that the hurricane caused. With record-breaking flooding throughout coastal communities, families and businesses have become displaced and in dire need of professional restoration practices to bring their properties back to their preloss conditions. 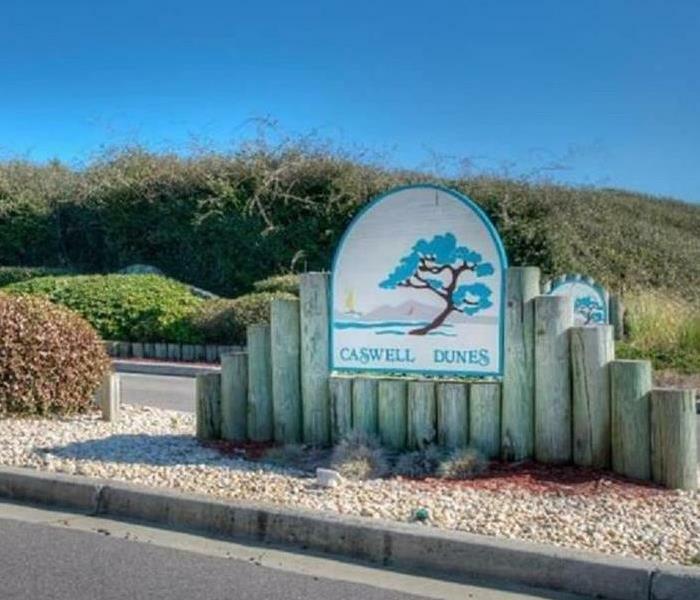 One of the locations that suffered considerable damage in coastal North Carolina was a local community Caswell Dunes. Structures suffered significant, which allowed the runoff and torrential rainfall from Hurricane Florence to enter the building. SERVPRO responded quickly to preserve what structural components they could and to lessen the possibilities of secondary effects like mold growth. Our SERVPRO franchise has always sought to help those when they need it most. Our select group of experienced technicians helps to provide our expertise and equipment to disasters that far exceed the limitations of the other local restoration companies serving the community. From extraction techniques to drying the damage that the building experienced throughout the flooding, our SERVPRO of Brunswick and S. Columbus technicians still work to bring this community back to its preloss condition. Much like our team that still works to bring hope and restoration to a recovering North Carolina, our technicians are always ready to help you through whatever disaster you or your property might have to face. Give us a call anytime that you need our experienced professionals at 910-755-6717. You wake up and walk into your bathroom to start the day. As you step into the bathroom, your foot splashes down in about an inch of water. As you turn on the light and see that water is everywhere in your bathroom, you see that the water is coming from underneath your sink and cabinet. You quickly rush over to investigate more. Opening the cabinet you see that a pipe has broken. Luckily, it is above the shut-off valve. You turn off the water immediately. Your next thought is to try to clean up the water, but there is A LOT of WATER. 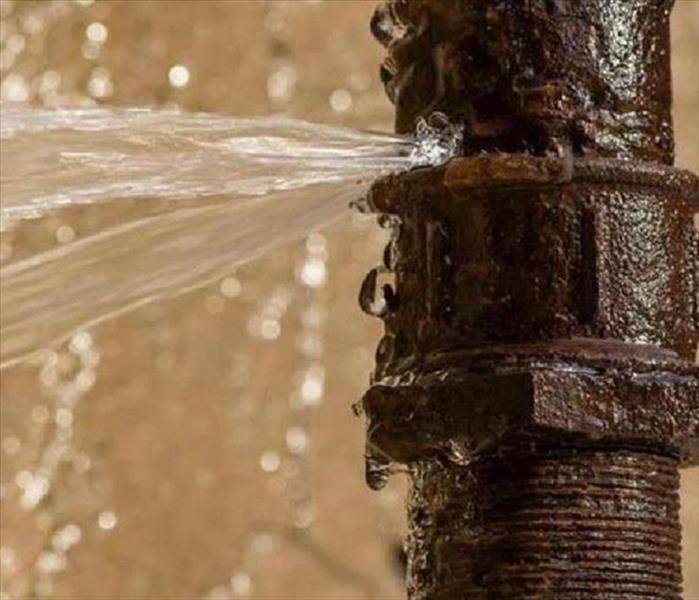 You know you need a plumber. Check. Who can help with the water and whatever damage this water is or may do to the bathroom floor and cabinets? That is where SERVPRO of Brunswick and South Columbus Counties can help. If you have had a broken pipe in your home or water damage from another source, SERVPRO of Brunswick and South Columbus Counties can help. Call us today, 910-755-6717! Apartment manager in Southport recently discovered some suspected Mold in a unit that she was getting ready to turn over to new renters after the previous tenants moved out. Thinking better than just having her “maintenance guy” just try to wipe up the suspected Mold, she remembered she had met a marketing representative from SERVPRO of Brunswick & South Columbus Counties at a networking event. She made the call and was very happy that she did. I t turned out to be Mold as she suspected and the technician from SERVPRO of Brunswick & South Columbus Counties did a thorough inspection and determined that it was indeed Mold and found the source. Within a couple days , the source was fixed, the Mold contained, area cleaned, and air filtered. All from one call to SERVPRO of Brunswick & South Columbus Counties. 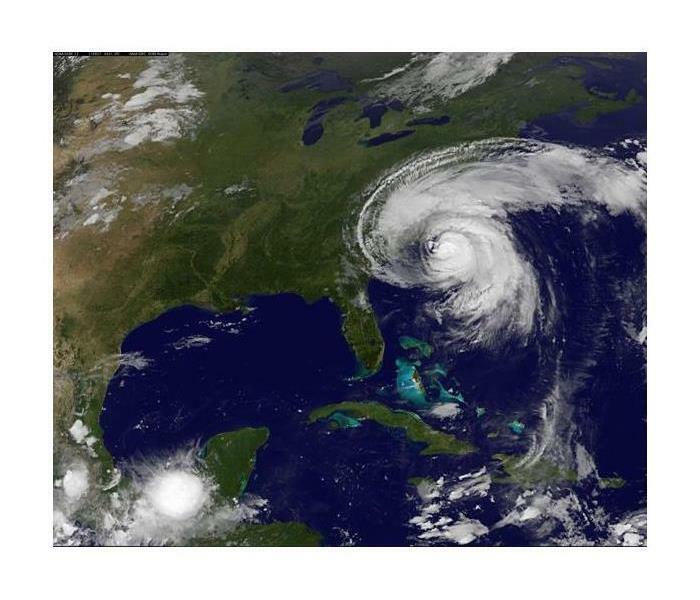 Summer is over, but hurricane season lasts until the end of November. Call SERVPRO of Brunswick and S. Columbus after the storm. Summer is coming to a close in Southeastern North Carolina, but it is still hurricane season. Below is some basic information and tips for protecting your Brunswick county home or business during Hurricane season. It is best to be knowledgeable, have a plan, and be prepared. If you are affected by a strong storm or hurricane, SERVPRO of Brunswick & S. Columbus Cos. can help. If you need our services, call us today at (910) 755-6717. 10/23/2018 - Caswell Dunes Damaged by Hurricane Florence. SERVPRO is here to help!